Like I said in my last post, cake pops are everywhere. JoLynn and Chris had a version of cake pops at their Vox Theatre wedding reception after their return to Kansas City from a destination wedding in Florida. 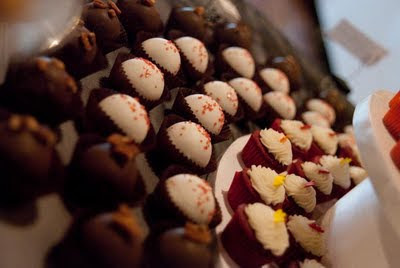 Along with a variety of mini-cupcakes, two flavors of cake balls were provided as treats for the guest - strawberries & cream and chocolate pecan turtles. Click here for another website with unique cake pop recipes.